I purchased the TST Industries low profile LED clear rear turn signals and flasher relay. My ultimate goal is to install soft luggage on my 2017 Yamaha FZ 09. On my bike the OEM turn signals protrude out in such a way that they interfere with the installation and operation of any of the soft or hard luggage available on the market. 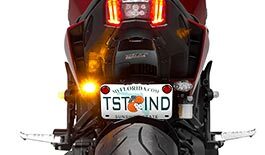 The TST low profile signals attach to the license plate and do not extend beyond the frame of the bike giving me the clearance I need to install luggage. I installed the TST turn signals on a T Rex Fender eliminator that I already had mounted on my bike. The installation was simple, I only had to remove the seat to get to the signal wiring harness and flasher relay. The T Rex Fender eliminator has a conduit for wire that I was able to use to fish the wires up into the bike. TST has very good detailed installation instructions on their YouTube channel. The wiring is plug and play, on the 2017 FZ 09 connect the yellow wire from the light to the brown harness and black wire from the light to the red harness. The lights are very bright, in my opinion substantially brighter than the OEM signals. All the mounting hardware is of high quality. Delivery was fast and customer service is excellent. I E-mailed TST customer service a stupid question and they responded in a timely manner with a polite helpful answer. top quality and perfect fit. TST rocks!